C-Grab Dual (CGD) fittings are used to create adjustable, 2-leg chain slings with minimal bulk. This is accomplished by the multi-purpose design of the C-Grab Dual. It allows you to connect two legs to a Gunnebo GrabiQ MF Master Link, and then adjust the chain legs to length, or even create a basketed sling. All of the is accomplished with only 2 or 3 "top-of-the-sling" fittings. The end result is a sleek, compact chain sling with fewer moving parts. 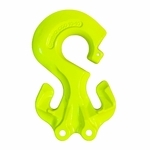 This makes it cost-effective and easier to inspect than a traditional chain sling. You can even combine this fitting with a CG Link to create a 3-leg chain sling, or simply pair it with another CGD link to create a 4-leg chain sling. View the table below, or click on the PDF link to view all specifications and be sure to use the right C-Grab Dual fitting with the right master link. Made from Grade 100 alloy steel. Each link is proof-tested and certified with a 4:1 safety factor.